Doug McKelway is a television journalist, widely known for his work in Special Report with Bret Baier, All- American New Year's Eve 2013, Fox News Sunday, and Fox Report. She is currently serving as a general assignment reporter for the Washington, D.C. bureau of the Fox News Channel. Douglas B. McKelway was born in 1954 in Washington D.C. His mother's name is Elisabeth Locher McKelway. His father, William Prentiss McKelway died due to kidney disease and congestive heart failure, who was a clinical professor at George Washington University Hospital and an obstetrician. McKelway is the grandson of Benjamin M. McKelway, an editor of the Washington Evening Star newspaper and President of the Associated Press. He has four siblings named William P. McKelway Jr, Martha Stringer, Margaret Clark and Dr. David A. McKelway. Douglas B. McKelway attended the Landon School in Bethesda, Maryland and graduated from there. McKelway then went to the Skidmore College, where he gained his degree in Bachelor of Arts. Douglas McKelway started his career in television in 1980 at WPCQ-TV (now WCNC-TV) in Charlotte, North Carolina. He served there until 1982 being based in several states such as Missouri, Kansas, and Florida before returning to Washington. Douglas McKelway became the co-host of Washington DC's Let's Talk Live on local cable's TBD TV on 13 May 2009, where he handled a live interview with blogger Michael Rogers explaining his forces to "out" secretly gay politicians who fight gay rights. At one point, McKelway told Rogers, "I'd take you outside and give you a punch in the face... I think you're hurting innocent people." WJLA discharged McKelway after a verbal fight with Bill Lord, the station’s news director, The run-in happened McKelway’s coverage of a Capitol Hill protest by environmental and religious groups that were protesting oil-industry contributions to elected officials. Lord questioned McKelway’s reporting and asked to meet with him. A yelling match between the men followed, leading to his suspension. He was eventually terminated for what the station called insubordination and misconduct. On November 2010, Doug McKelway joined Fox News Channel (FNC). Currently, he is working as a general assignment reporter for the Washington, D.C. bureau. Most recently, McKelway contributed live coverage of the consequence of Hurricane Irene in Ocean City, MD. Douglas McKelway replaced for Brett Baier on Fox News' Special Report, giving him exposure amongst the large early-evening Fox audience during the Thanksgiving Holidays in 2013. McKelway has appeared on various TV shows like The Real Story with Gretchen Carlson, Fox Report (1996), Special Report with Bret Baier (1996) and Your World with Neil Cavuto (1996), Fox and Friends (1998), The Kelly File (2013) among others. In his spare time, McKelway plays the Banjo and performs Bluegrass music at local restaurants occasionally. McKelway is a happily married man. His wife's name is Susan Ferrechio, a chief congressional reporter for The Washington Examiner. 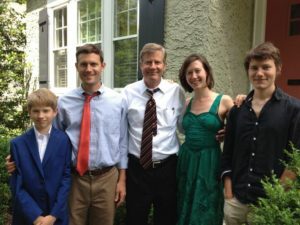 They got married after a long-term affair.The couple has three sons and one daughter named, Doug, Chris, Alexander and Eliza. McKelway earns an attractive salary however, his exact net worth has not revealed yet. Douglas belongs to white ethnicity and holds an American nationality. He is also active on social networking sites.